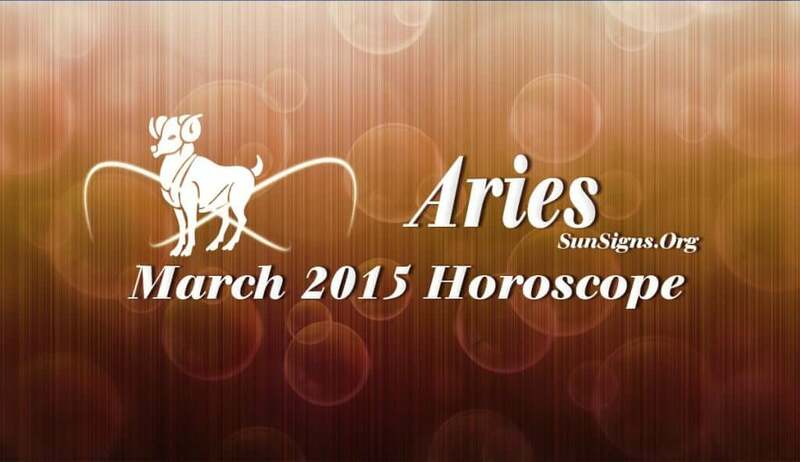 March 2015 Aries Monthly Horoscope forecasts that the focus will be on career and personal achievements. Majority of the planets are in the upper half during March 2015 for the Aries zodiac sign. Domestic matters and psychological issues will also be important for the Arians though to a lesser degree. Planetary strength is more in the Eastern sector towards the ascendant. The tendency to assert yourself will be stronger and the period is auspicious for the Rams achieve your objectives. Divine forces will help you in your efforts. You create your own fate during the month. The Aries March 2015 career predictions foretell that you will reach your peak in your profession. Your efforts will be recognized and amply rewarded. If you are thinking of starting your own venture, you can go ahead with your plans. For the unemployed, last week of the month will give positive results. The Aries March 2015 financial astrology predictions forecast that income will be fabulous after the third week of the month. Speculative investments will yield good profits. New relationships for single Aries are possible after the third week of the month. You should maintain peaceful relationships with your spouse in March 2015. This is a period for spiritual activities and you can improve your emotional quotient by contemplation and meditation. The Aries March 2015 horoscope suggests that this month can be used for personal growth by overcoming dangerous addictions and forming good habits to improve the quality of your life.